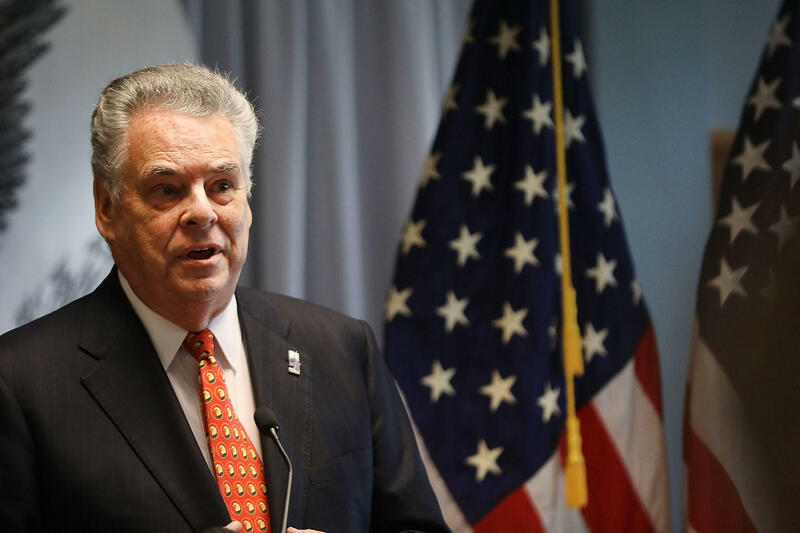 Rep. Peter King, a Republican representing Long Island, has been heavily lobbied by groups on both sides of the GOP health care bill who are intent on getting him to vote their way. The latest snag is over whether people with pre-existing health conditions should have guaranteed access to affordable coverage, as the ACA mandates. An amendment that would let states waive some of those requirements has garnered the votes of reluctant conservatives but left more moderate Republicans concerned. By Wednesday, however, the combination of pressure from House leaders and President Donald Trump himself seemed to be turning at least some votes. Following a White House meeting, Rep. Fred Upton, R-Mich., a former chairman of the House committee that handles most health issues, said he would vote for the bill if it added an additional $8 billion to help those with serious health problems pay for coverage. That same promised amendment also changed the vote of Rep. Billy Long, R-Mo., a Trump supporter who had said earlier in the week he planned to vote against the measure. "I've supported the practice of not allowing pre-existing conditions to be discriminated against from the very get-go," Rep. Fred Upton (R-Mich.), a former chairman of the House committee that handles most health issues, told a Michigan radio station Tuesday in explaining his decision not to support the bill. "This amendment torpedoes that." House leaders stressed that they are still working to muster a majority to pass the bill, which was originally scheduled for a full floor vote in March. 1. The House passes its bill soon. Approval in the House would send the measure to the Senate, where the fight will be very different. Congress is using a special budget procedure that allows the bill to pass with 51 votes. There are only 52 Republicans in the Senate, so they can't afford to lose more than two GOP votes, assuming every Democrat opposes the measure. In that case, Vice President Mike Pence would be needed to break a tie. While this special procedure makes it easier for Republicans to pass their bill, the Senate's budget "reconciliation" process must follow a series of specific rules that exclude any provision in the bill that doesn't directly affect the federal budget. Various parts of the House bill, including the recent change to let states waive some coverage rules — a provision that has ignited concerns about preexisting conditions — have been mentioned as possible violations of those Senate rules and would have to be taken out in order to qualify for the protections of reconciliation. The Senate may also amend the bill and the House would have to approve those changes, which could again break the delicate coalition of House GOP support. 2. The House walks away from the debate. In theory, the GOP votes necessary to pass the bill continue to elusive, the House could just leave health care for another day — or another year. That would be a huge setback for President Donald Trump, who campaigned on a pledge to "repeal and replace" the health law, as well as for congressional Republicans, who have been promising to do the same since the bill became law in 2010. But if the law truly implodes for 2018, meaning insurers drop out of so many areas that millions of people have no insurance options, it could trigger an entirely different health debate. 3. The House decides to switch gears to tax reform. Health care is not the Republicans' only high priority. So is an overhaul of the federal tax code. But Republicans want to use the same budget reconciliation procedure to pass their tax plan. That's a problem. In order to make sweeping tax changes under expedited budget rules, the House and Senate would have to move on to a fiscal 2018 budget resolution, which would override the 2017 budget blueprint. But as soon as it does, the protections for the health bill would expire. There is another option. Each budget resolution can allow one spending bill and one tax bill to be protected by reconciliation rules. So Congress could simply start the process over in a 2018 budget resolution that would allow it to move on tax reform and changes to the health law simultaneously. 4. Congress tries to overhaul the health law incrementally. The House could abandon the budget process and simply pass bills without regard to whether they have an effect on the budget. The first step, though, would likely be for the House to repeal the ACA wholesale — giving Republicans political cover. Then they could take up smaller pieces of legislation, such as a bill that would allow health insurance to be purchased across state lines, a favorite idea of Trump's. Those bills, however, would require 60 votes in the Senate, which seems unlikely given the opposition from Democrats. If the GOP efforts to bring wholesale change to the ACA are exhausted, though, it may be possible for some moderate Republicans to work with Democrats to craft legislation to fix some of the issues that both parties see in the law. 5. The Senate gets rid of the legislative filibuster. The Senate earlier this year abolished the need for 60 votes to fill a Supreme Court seat, and that got Trump's nominee, Neil Gorsuch, approved. Trump has been calling for Republicans to also get rid of the filibuster for legislation. "Either elect more Republican Senators in 2018 or change the rules now to 51%," he tweeted on Tuesday. But the legislative filibuster is the last protection for a Senate minority party, and Republicans know they will someday be in the minority again. Senate Majority Leader Mitch McConnell (R-Ky.) has said repeatedly he has no intention of taking this step, telling reporters Tuesday it "would fundamentally change the way the Senate has worked for a very long time." And even if he changed his mind, he might have trouble persuading some of his Republican colleagues to go along.